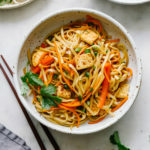 This Vegetable Lo Mein with Tofu is super versatile, easy to throw together and will be on the table in 30 minutes! Recipe inspired by Cooking Light: Global Kitchen Cookbook. Tofu: Start with the tofu by cubing it into 1/2 cubes and drying the cubes between a dish cloth or paper towels to remove excess moisture. Heat up a skillet nice and hot with a little oil, cook tofu, shaking the pan often to keep them from sticking, on each side for about 5 – 6 minutes, or until golden and lightly crispy looking. Set aside. Noodles: Cook the noodles according to package directions, and set aside. Sauce: In a small bowl whisk together the tamari (soy sauce), pure maple syrup/mirin, sesame oil, and rice wine vinegar, and set aside. For a little heat, add a pinch of red pepper flakes or sriracha to taste. Stir-Fry & Combine: Heat oil in a large skillet or wok over medium heat. Add in the onion, stir fry for 3 minutes. Add garlic, carrots, and red bell pepper, stir-fry until al dente, about 4 minutes. Add the noodles and sauce, toss well to combine. Add the tofu and scallions, mix again. Serve right away with bean sprouts and fresh cilantro for garnish. Store leftovers in the refrigerator for up to 5 – 6 days. Or keep in the freezer for up to 3 months (defrost before heating). Reheat: Lo mein can be reheated on the stovetop on low heat, until warmed through, adding extra sauce or veggie broth to bring back moisture as needed. For variation try these vegetables – Broccoli, asparagus, cabbage, bok choy, edamame, green beans, scallions, onions, bell peppers (any color), mushrooms, baby corn, snow peas, snap peas, and water chestnuts. If using MIRIN, please use mirin that does not contain corn syrup and other harsh ingredients. Look for mirin that uses water, rice, koji and sea salt. The only two I know of are Eden Food’s Mirin and Ohsawa Genuine Organic Mirin. Make this gluten-free by using rice noodles, or other gluten free spaghetti or linguini noodles. Oil free version: Make this oil free by using veggie broth in place of oil when stir-frying. Also omit the oil in the sauce.